The following videos and resources review the basics and uses of business plans. In this video, David Thompson from the Rural Agri-Innovation Network (RAIN) discusses tracking market trends and developing a realistic business plan. Tony and Fran McQuail discuss holistic management planning with a focus on the finances. They address the importance of developing a plan that fits with the vision and preferences of the team, and is understood and shared by everyone as they implement it together. Financial Planning manual 2012. If you are interested in learning more about the Holistic Management method for financial planning, this report is an excellent starting point. Click here to view this PDF. Backcasting Chart. Click to view this PDF. 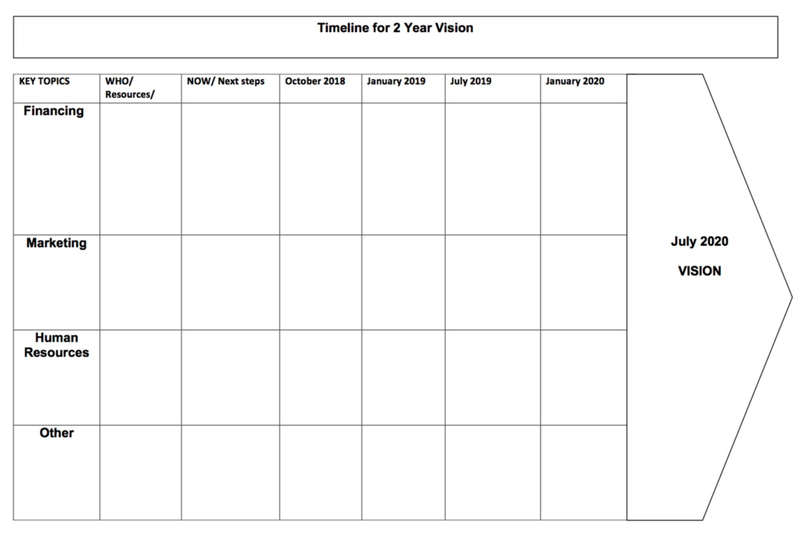 Using this worksheet, backcasting guides a team to work backwards from vision through incremental milestones to create a realistic timeline for product development. Before drafting your business plan, you can create an overall 2 or 3 year plan with your team through a process of “backcasting”. The graphic below shows the framework for backcasting, with six month increments for planning. Backcasting planning is usually done by category. In this model, the categories are “Financing”, “Marketing” and “Human Resources” but these can be adjusted to fit planning needs. In this exercise, you start from the vision you have created earlier. You decide when it is reasonable to expect to reach that vision, and work backwards to identify where you need to be in the months or quarters before that to reach the vision. The link below provides a worksheet with instructions and the graphic, but it is generally easier to work on a larger sheet with plenty of room for everyone to add their ideas. The completed form then provides a framework for your business plan. Example: Juices and Jams has the goal of introducing a natural soda line by the beginning of year 3. In order to do that, working backwards in the two years of development, they see that all the equipment will need to be in place six months before that to complete testing. The manager will have to be hired by then as well but trained before the testing starts. Capital would need to be in place well before that, in order to buy the equipment. So they would need in year 1 to develop the package to take to investors to raise the new capital, as well as to begin assessment of equipment to be able to buy the right machines in year 2.